It’s become a Christmas tradition here on the Old Topographer blog to republish one of my most popular postings – the true story of General George S. Patton’s Christmas Prayer. So it is with Christmas 2016. I want to wish everyone a Merry Christmas and hope this holiday season finds you and your loved ones safe and happy. And please let’s keep all the service men and women, both deployed on battlefields across the Middle East and stationed here at home, in our thoughts and prayers. In early December 1944 General George S. Patton’s 3rd Army was stalled in its advance to the Siegfried Line along the French – German border. Patton was a master of combined arms operations and he knew he needed tactical air support from the Army Air Forces before he could breach the Siegfried Line and push on towards the Rhine River. But the weather was not cooperating. The winter of 1944 was one of the worst on record for central Europe. Thick cloud decks and heavy fog were keeping Allied aircraft grounded all across France and the Low Countries. Patton was frustrated, impatient and angry. He saw German resistance crumbling before him yet he knew he couldn’t push forward into the German homeland without adequate air cover. The 3rd Army and its supporting 19th Tactical Air Command ground attack squadrons were a deadly team. Ground-based artillery often had trouble keeping up with the 3rd Army’s advanced forces, but the Air Force’s growing fleet of attack aircraft like the rugged and deadly P-47 Thurderbolt could range ahead of the forward ground forces, striking military strong points, attacking enemy convoys and in general wreaking havoc and helping to open lines of advance for Patton’s armored formations. In the second week of December Patton’s frustration hit a boiling point. Patton was a man of deep religious faith and he absolutely believed that God was on the side of the Allies. The General decided it was time to remind the Good Lord just who’s side he was supporting. On December 8th Patton put out an order directing all 3rd Army chaplains to pray for good weather. At the same time he called for his staff chaplain, Colonel James O’Neill. After the war the chaplain, Monsignor James O’Neill (by that time a retired Brigadier General) wrote down his version of the story. It helps clarify some of the dates surrounding the event. In the classic movie ‘Patton’ starring George C. Scott we are led to believe that Patton ordered the prayer in reaction to the 3rd Army’s difficulty reaching the Ardennes as it advanced to relieve American forces trapped during the Battle of the Bulge. The truth is that Patton ordered this prayer at least a week before the Germans launched their offensive into the Ardennes. 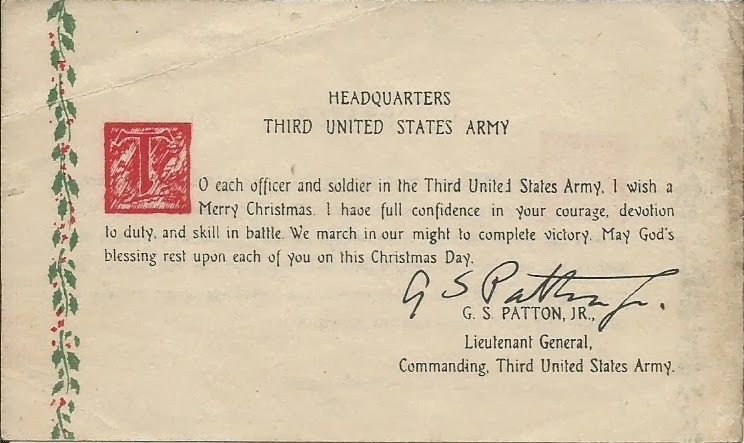 Patton directed that the prayer, along with his Christmas greeting to the Soldiers of the 3rd Army, be printed and distributed just before Christmas. The printing job was immense. Virtually every Soldier in the 3rd Army was to receive a copy so hundreds of thousands of copies needed to be printed, and printed fast. The job was beyond the capability of the printing services available within the 3rd Army Adjutant General’s office. Chaplain O’Neill discussed the requirement with the 3rd Army Engineer and the decision was made to have the 664th Engineer Topographic Battalion, with its multiple large format offset presses, execute the print mission. 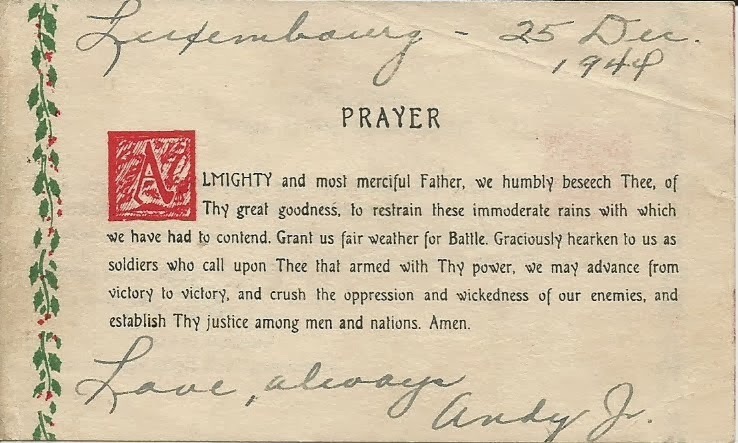 By December 14th 1944 the prayer was distributed throughout 3rd Army. On December 16th the German Army launched operation ‘Wacht am Rhein’ (‘Watch on the Rhine’) or as we refer to it today, the Battle of the Bulge. Hitler’s plan was to attack west through the Ardennes region in Belgium, capture the port of Antwerp, split the Allied armies in two and force the Americans and British to accept a separate peace. Within 24 hours of being notified of the German offensive Patton turned the entire 3rd Army 90 degrees and raced north to relieve the trapped forces. Patton smelled blood; the Germans had stuck their neck out and he intended to cut it off. But he still had to contend with the weather. For seven days the American forces trapped in the Ardennes pocket struggled to hold back the German onslaught, but were denied close air support due to the foul weather. Then suddenly, unexpectedly, on December 23rd the weather cleared. Allied aircraft could range freely over the Ardennes and they extracted a fearsome toll on the Germans. At the same time 3rd Army forces smashed into the southern flank of the German pocket, shattering and all but destroying the enemy forces before it. The German Army never recovered from the Battle of the Bulge and ‘Wacht am Rhein’ was the last offensive ever mounted by Hitler’s military. Patton was convinced that the prayer, as applied by 3rd Army Soldiers, was instrumental in changing the weather in the Allies favor. In Patton’s mind it was confirmation that God was on his side and on the side of the 3rd US Army. For his part in composing the prayer Chaplain O’Neill was personally awarded the Bronze Star medal by Patton. The story of Patton’s prayer is important to me for two reasons. First, the images of the card you see above are those of an original card issued to my uncle, Captain Andy Harbison. Andy was a battery commander in the 176th Field Artillery Battalion which was operating in General Support of 3rd Army. He signed the card and sent it home to my Aunt Dorothy (Dottie) Harbison in Buffalo, NY. This extract from the 176th’s field log highlights the battalion’s involvement in the Battle of the Bulge. The second reason is the 664th Engineer Topographic Battalion’s involvement in the printing of Patton’s prayer. While not a ‘mapping’ mission, it still represents a fascinating piece of US Army WWII topographic history. Almost 39 years to the day after General Patton ordered these cards printed I reported for duty with the indirect successor of the 644th Engineer Topographic Battalion. As a young Engineer officer I found myself assigned to the 649th Engineer Battalion (Topographic) in Schwetzingen, Germany. The 649th provided topographic support – mapping, survey, terrain analysis and map distribution – to all US Army forces in the European theater. A tenuous connection perhaps, but I like to think that I am part of the legacy of units that helped the US Army achieve victory in WWII. Like General Patton let me wish you all a Merry Christmas in the firm belief that the Good Lord is on our side. This entry was posted in History, Military and tagged christmas, patton by Brian Haren. Bookmark the permalink. We serve an amazing God. Bless you for sharing this. Thank you so much for publishing Patton’s Prayer. He was a remarkable character in our nation’s history. We owe so much to all the military men of that generation.